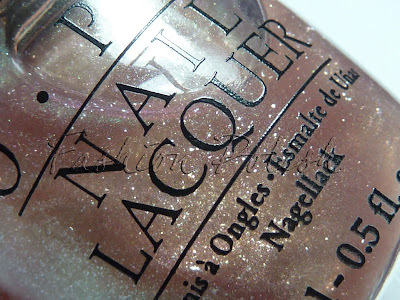 Today I have a subtle layering with OPI Rent. Rent is a sheer slightly duochrome pink base with a green flash and silver microglitter flecks. It was released in 2003, as part of the Holiday on Broadway collection, it's a black label OPI, both pre B3F and prowide brush. Rent is now discontinued but you can still easily find it for a reasonable price, Transdesign still has it for $5,75. Like I said, it is very sheer; over a very dark base, you'll see a bit of its duochrome but over a light color like Lapis of Luxury, you'll have a slight pink tone and those gorgeous silver flecks. Gorgeous!! :) I love it! Nice! I can't wait to see the next combo! So pretty. I rarely think of layering polishes unless I've got some chips. I love Lapis of Luxury. Lovely manicure. What a fun way to play with your nail polish! It came out pretty! Your blog is amongst my top 5, I must say. Your photos are so good. Great combo!!! Delicate and playfull. Looing forward to the next one!!! I need LoL...why don't I have it? hmmm!!! Great idea doing multi combo layering on one base!